SUNPIN - Professional DVD Player Producer,Bring Sunshine into Your Life ! 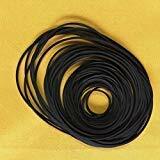 Not like other sellers who purchase products from manufactures, SUNPIN is a company with his own manufacture that majors in Audio Products, we guarrante your profit from the origin. 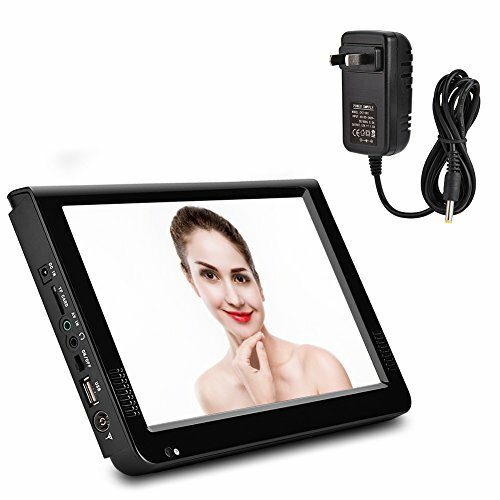 SUNPIN D969 portable DVD player obtains a totally different TFT-LCD screen(220cd/m2). It allows an optimal, natural viewing experience with more brightness and less glare. It brings tons of fun to your children on road trips. Also can be a brilliant gift for your friends and family members. Makes it more convenient for two people watch videos in a quiet circumstance, such as in library and on a bus trip. Warm Tips: Earphone jack 1, only the earphone has sound; Earphone jack 2, both the speaker and the earphone has sound. 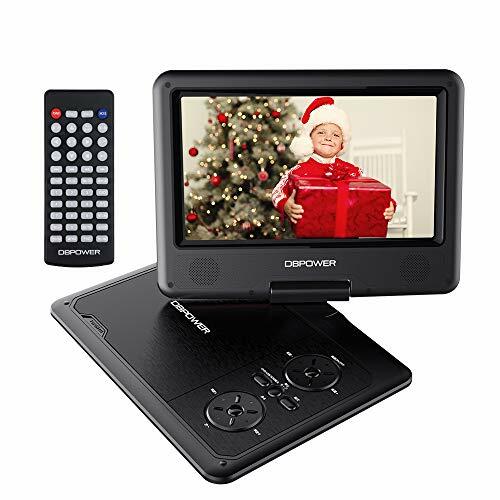 This DVD Player is perfect for long car or plane journey due to its built-in high-capacity 5-hours rechargeable lithium battery. 5 Hours is Not enough? Our product also comes with a car charger, no more worries on draining off the battery when you are out on your road trips. Support SD card and USB: You can enjoy your digital movies and MP3 files directly from a USB flash drive or SD card. Support connection TV : Connect TV to share happiness with the whole family. BRIGHTNESS-ENHANCED SCREEN - As a Company with Their Own Manufacture,SUNPIN Adopts Professional High Brightness LCD Screen on Its Product, Which Brings You Clearer and Brighter Images. DOUBLE-EARPHONE JACKS - With the Double Earphone Jacks, Two Kids Can Enjoy the DVD Player Simultaneously By Two Headphones. Buy One DVD Player To Keep Two Kids Quiet and Peaceful. AV CONNECTION TO TV - With Help of the Included AV Cable, Customers Can Connect the DVD player to TV to Enjoy a Movie With the Whole Family. WATCHING ON THE TRIP - With the Included Headrest Mount Holder Strap Case, Customer Could Hang the DVD Player Onto the Back of a Car Seat and Enjoy Movies or Music During the Whole Trip, Especially Good for Kids. BEGIN WHERE YOU LEFT OFF - SUNPIN PDVD969 Portable DVD Player is Designed with Last Memory Function, Which Makes Watching More Convenient by Resarting from the Break Point, Professional Audio Equipment. AV CONNECTION TO TV - With Help of the Included AV Cable, Customers Can Connect the DVD player to TV to Enjoy a Movie With the Whole Family. Otherwise, Two PDVD969 Could Also be Connected and Play Simutaneouly. SUNPIN - Professional DVD Player Producer - Bring Sunshine into Your Life ! Not like other sellers who purchase products from manufactures, SUNPIN is a company with their own manufacture that majors in Audio Products, we guarantee your profit from the origin with much professional technique support team. 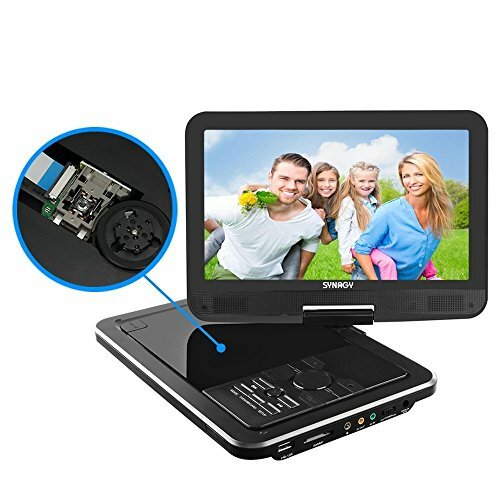 SUNPIN D969 portable DVD player obtains a totally different TFT-LCD screen(220cd/m2), which allows an optimal, natural viewing experience with more brightness and less glare. You can enjoy your digital movies and MP3 files directly from a SD card or USB disk. 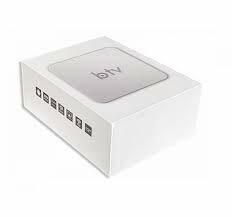 TV Connection Available: With the AV Cable in the package, you can connect the player to TV, and enjoy bigger screen view at home, perfectly take the place of the traditional DVD Player. What's content in the package? SUNPIN as a manufacture owns a professional customer service team and provides 1 year warranty on all of its products, please don't be hesitate to contact us at any time, for any problem ! 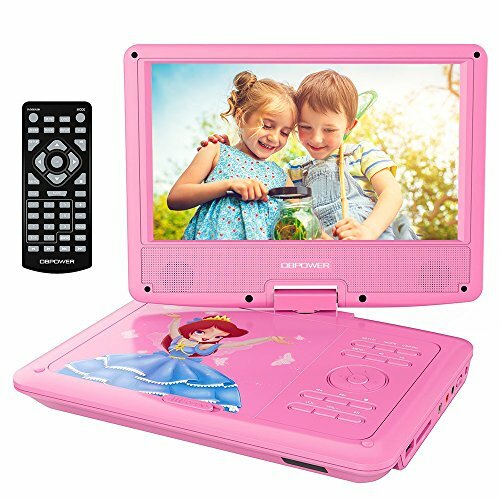 SYNAGY is a direct manufacturer, and has been in manufacturing portable DVD players and other consumer electronic products for several years. Ever since 2015, SYNAGY has been dedicated to providing happy online shopping experience to our customers. We believe that, the most importance to success is to provide the best shopping experience, products with the best quality, affordable prices, fast delivery and top-tier customer services. If you have any problems regarding on our portable DVD players, please let us know and we will help you very quickly. If you don't like our portable DVD players, we are very happy to refund every penny for you and listen your suggestion. No need to wait anymore, just press "Add to cart" and you will get the best portable DVD player soonest. Fantastic 270 Degree Swivel Screen - SYNAGY portable video players provide (1)180 degree rotation to left (2)90 degree rotation to right (3)180 degree vertical flip-over to a tablet style, making your hands free & feel more convenient at a watching angle.We have a promotion that get a 10.1"-10.5" SYNAGY Car Headrest Mount Holder for free when you purchase 1 or more SYNAGY 10.1" Portable DVD Player. Please add both to cart and enter code 2OVIW58N at checkout. Support Multiple Media Format - SYNAGY personal video players can play CD, DVD, DVD-R, DVD-RW, VCD, S-VCD, MPEG2, AVI, WMA, JPEG. Also, it can also play MP3,MPEG2,JPEG,WMA,DIVX, AVI with USB and SD cards. Provides with 3 Power Systems - SYNAGY personal DVD players provide AC power adapter, car charger & rechargeable lithium battery, making you use more convenient at more places.Note: after a full charge, the portable dvd player can play about 4 hours. 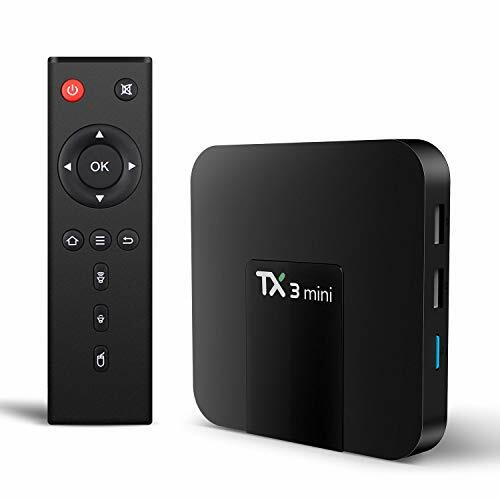 1,The TX3 Mini TV Box doesn't support Bluetooth.But support Single Band Wifi 2.4GHz. with backlitght, Plug in the dongle, Connect to device via Bluetooth. EVANPO has a year of warranty. Please DO CONTACT our customer service when you have any problems on using it. We are professional, with friendly, fast and best customer support. Create Smooth High-resolution Images 1080p Up-Conversion raises image quality by correcting, in pixel units, the brightness signals of images in recorded content, DVD movies, and other media. Clear, Beautiful Pictures This high-speed, high-precision circuit converts DVD video signals using 4-times oversampling for progressive scan playback and 8-times oversampling for interlace scan playback. The high-density conversion process results in clear, beautiful pictures with high resolution and high S/N ratio. Video: DVD, DVD+R, DVD+R DL, DVD+RW, DVD-R, DVD-R DL, DVD-RW. Audio: CD, CD-R, CD-RW,File Formats Supported: JPEG, MPEG1. NOTE: This is not a blu ray player. GooBang Doo Safe adapter with power magnet: It can help suppress rush current efficiently, so that static electricity is released slowly. Join DBPOWER and enjoy your favorite movies on our latest portable DVD player. 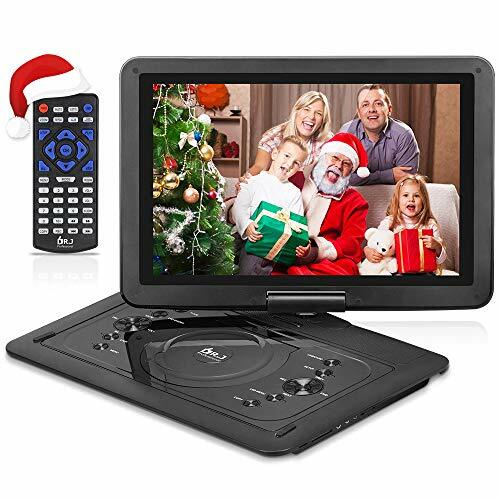 Everyone loves movies and TV series and this DVD player makes a great gift for anyone on Christmas, Thanksgiving, birthdays, Mother/Father's day, or simply as a great gift at any time of the year to show your love to your friends or family. With the improved rechargeable battery, playback time is extended to 5 hours. Plus, the with the AC adapter and car charger, kids and parents can enjoy an entertaining time either at home or on the road. Thanks to the 270-degree rotation and 180-degree flip of the DVD player screen, you can easily attach it to the back of a car headrest. This is ideal for keeping the kids quiet on a long journey. In addition, the high-quality materials used in the construction of the player ensure years of use. Constructed with premium materials and built to last, it also features excellent heat dissipation properties that ensure faster and more efficient heat dissipation faster. Four anti-skid feet on the base on the DVD player make it suitable for any surface. With the included AV cable, you can stream what's being played on the DVD player to your TV to enjoy movies on the big screen. Or it can be connected to another DVD player of the same type, enabling you to share what you are watching with others. GREATER VOLUME We have listened to your suggestions about the DVD player and have now installed stereo speakers in the DVD player, meaning that the volume can now be heard from 15 meters away. Additionally, you can use the headphones if you prefer. MULTIMEDIA COMPATIBILTY Thanks to the compatibility with USB drives and SD cards, you will never be bored or stuck for things to watch when out on the road. Simply load your favorite videos, music, pictures or e-books onto a USB drive or SD card and insert into the DVD player; it will play directly, conveniently and quickly. AV CONNECTION TO TV Using the included AV cable, you can hook up the DVD player to a TV to watch movies on the big screen. Alternatively, it can be connected to another DVD player of the same type, enabling you to share what you are watching with others. HASSLE-FREE ONE-YEAR WARRANTY If you do not enjoy our DVD player, just let us know, and we will replace it free of charge or refund your money within one year from purchase. Customer satisfaction is our highest priority. UNBLOCK TV BOX Authorized seller. 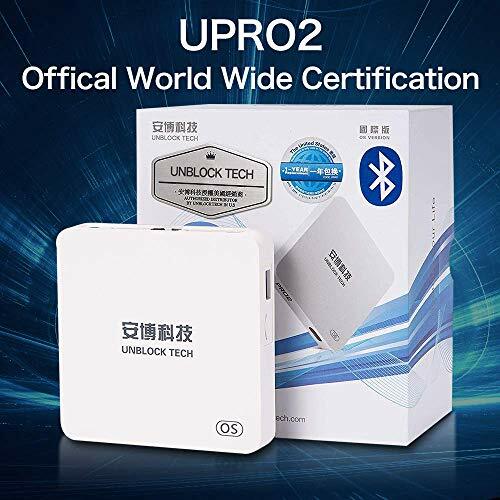 Our company was founded in Hongkong in 2015.Our company already being 5 years cooperation with UNBLOCKTECH COMPANY Unblock tv box has a golden lable paste on tv box. If your tv box do not have that. Please contact us . We will help you verify it is fake or not.please add WECHAT: unblock-tv-box. 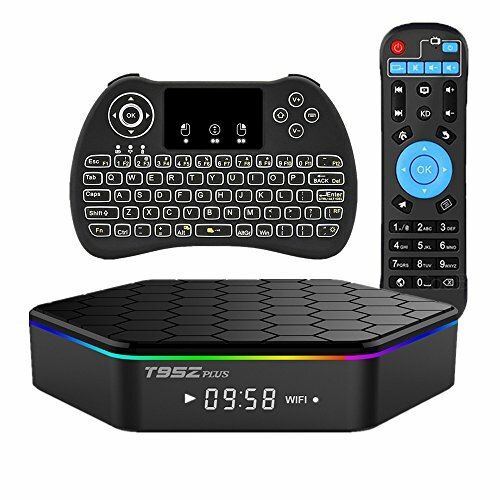 If get 5 stars review also have nice 5 items 3.Our company Tv box provide 2months no reason return service.1 years after sale repair replace return service . Other company only have 1 year.We alao have life time warranty.Nothing worry if buy from us. If have any problem please add we chat unblock-tv-box 4.We have Unblock after service STORE in US UK CA JP HK and more SO BUY FROM us is nothing worry. Adult Channel in UBTV password is 1818 5.2019 Lastest Upro2 I950 carries the latest H6 CPU and Android 7 system .UBTV APP live channel has been increased by 50percent compare ubox4.The CPU supports 4K@60fps, the max resolution (ideal) is 6K It also supports HDR10, HLG decoding features. Furthermore, the H6 CPU integrates Allwinner Smartcolor 3.0 smart engine in which optimize the color range and increase the. UBOX Upro has a more compact size than the last Ubox 4.Especially Upro use the independent server. 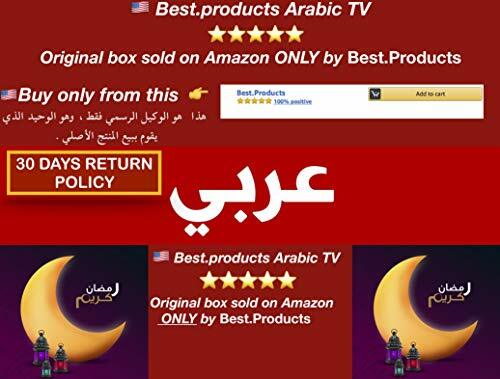 You will very satisfy about our tv box. Adult , Sport, Kids Channels and so on. Want All Channels List ? Please Send An Email To Ask The Seller. Image Browser: Support JPG JPEG BMP GIF PNG...etc photo format. Remote Control: Support IR Remote controller and usb mouse & keyboard. No monthly or yearly fee, life-time subscription for over 1600+ global live channels. The set top box enables you to enjoy abundant tv channels for free. there is no need to worry about the high cost of cables. 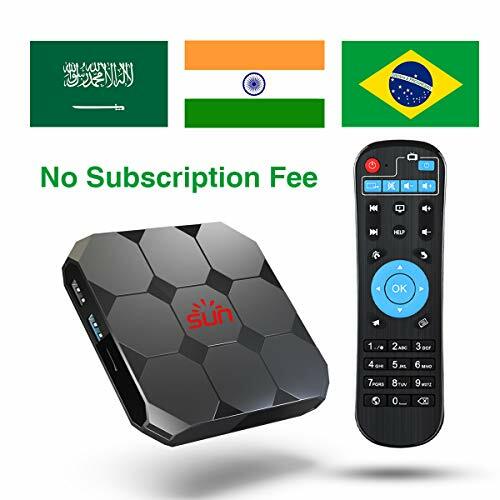 Best IPTV box that designed for oversea people who are eager for motherland languages and programs, including Sports Channels News Channels 18+ Channels Brazil Channels Arabic Channels India Channels . France, Korean Language Live Channels in religion, drama, kids and much more. 2GB RAM 16GB ROM large memory capacity IPTV box, with resolution support up to Full 2160P@30fps. Support 4K Video, built in app store with applications, support Google Play APK installation,support DLNA Protocol. You can browse the applications with IR remote controller or mouse and keybord through USB port. Very easy to use, just plug and play. 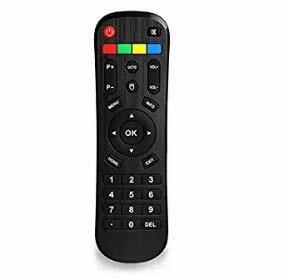 Unlike other IPTV boxes on the matket that you will have to subscribe first, this box is unlocked with all the programs that you can easily access to your preferred channels with the remote. World IPTV box including 1600+ channels from many countries. If you want a channels list, please send an email to asking seller. Very easy to install and operate, Our box has everything you need. 1) Power on, then Go to setting 2) Find WIFI or Ethernet, connect to internet 3) Click back to the Home Screen. Enjoy!!! This digital TFT-LED TV player equipped with 1500mAh rechargeable battery allows you watching TV outside or inside. Besides, thanks to a built-in USB port and SD card slot, you can watch videos directly from U disk or TF card. And HD TV show can be recorded into USB flash memory or hard disk. In all, this portable digital TV player is really great for general daily recording or indoor / outdoor entertainment. 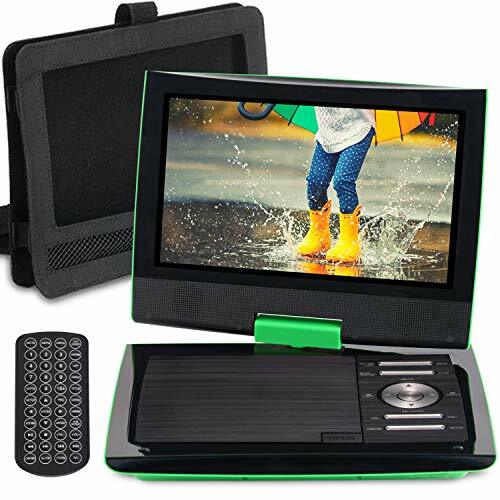 Portable TV, complying with ISDB-T, allows you watch analog TV, digital TV and ATV. Providing a 110v ~ 240v universal power supply adapter, adopting DC 12V input design is more secure. Support U disk and TF card; Support high birate decoding; Support 1080p video. Support MKV, MOV, AVI, WMV, MP4, FLV, MPEG1-4, MP3 format. Equipped with 1500mah rechargeable lithium battery for about 90 minutes using time outdoors. High sensitivity tuner, enhanced signal reception capability. You can record HD TV shows and store it into USB flash memory or hard disk - PVR function. 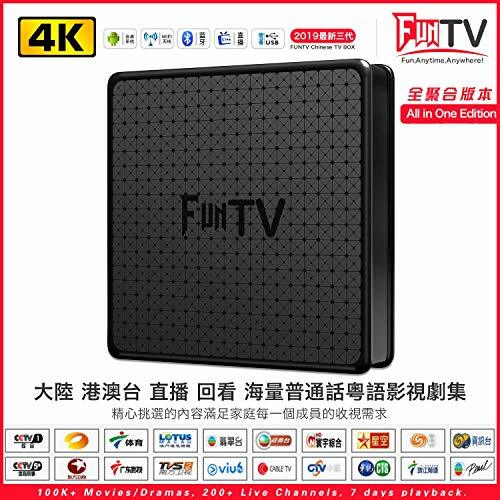 FUNTV Chinese TV Box 2019 All in One Edition(Mainland/Hong Kong/Macao/Taiwan), 100K+ Movies/Dramas, 200+ Live Channels, 5 Days Playback.  FREE TO WATCH With the network, then you can watch TV, all contents are free and no anual fees needed. 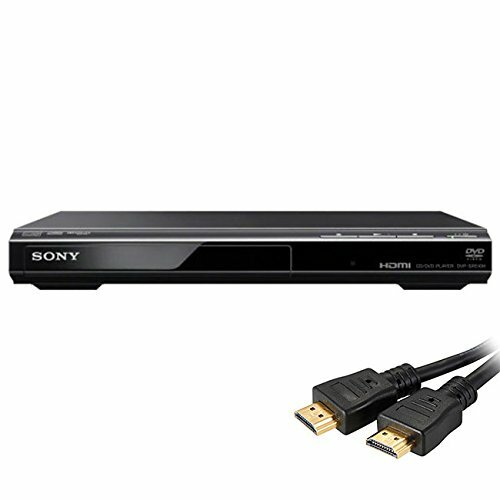 Improve the playback picture quality of your DVDs so that they look better on your HDTV with the Sony 1080p Upscaling DVD Player. This DVD Player Bundle from Focus Camera comes paired with a 6 ft. HDMI Cable and DVD Lens Cleaner so that you can keep your player clean but also have it reach further way devices. Break out your old DVD collection and instantly boost the playback quality to 1080p resolution. Connect the DVD player to your TV using an HDMI cable and see standard definition movies convert to smooth, jagged-free Full HD. Measuring in at just 10.6-inches in length, this DVD player's slim, compact design makes it a simple and stylish addition to your home entertainment system. This 1080p Upscaling DVD Player from Sony supports the playback of a wide range of media files so you can watch movies, browse phones and listen to music. This includes CD-R/RW, DVD-RW/+R/+R DL, DVD-RW/-R/-R DL (including 3.15 in DVD), JPEG, MP3, WMA, AAC, and linear PCM playback. Sick of switching from remote to remote to control you TV and DVD player? Now you can control most major brand televisions with the included remote. UPSCALING DVD PLAYER: Break out your old DVD collection and instantly boost the playback quality to 1080p resolution. 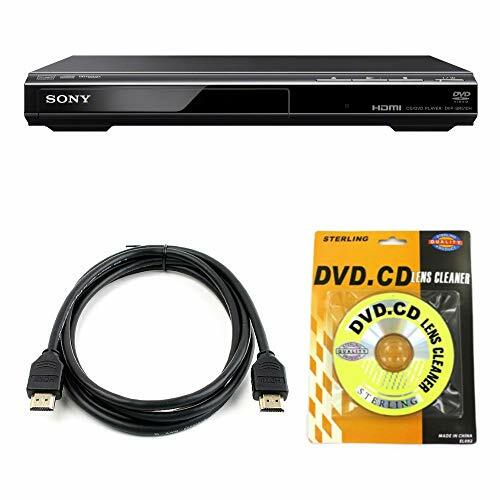 Connect the DVD player to your TV using an HDMI cable and see standard definition movies convert to smooth, jagged-free Full HD. PROGRESSIVE TECH AND DOLBY DIGITAL: The Sony Precision Cinema Progressive system detects image changes at the pixel level. The picture is more faithful to the source -- whether film or video -- because special algorithms handle the different pixel behavior. 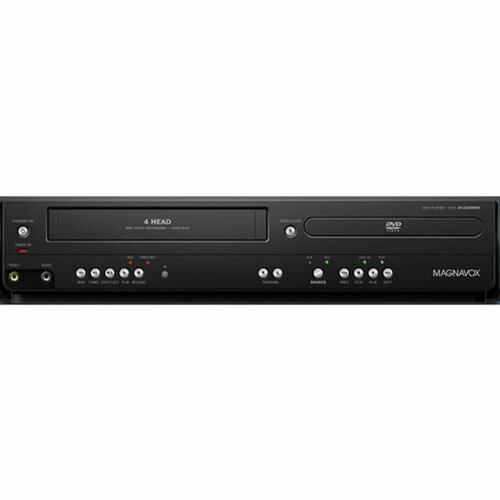 Supports enhanced audio formats from Dolby and dts and provides connectivity to some older receivers and televisions allowing the player to work with some audio systems. It delivers 5.1 channel surround sound when you're watching movies. POWER SAVE AND SAFETY: This Sony DVD is Energy Star compliant, boasting just a 6-watt power draw, it cuts your monthly energy bills and is environmentally friendly. A child lock feature help prevents children from accessing the DVD player's tray.